Your investment goals are as personal as you are. And although identifying your goals is a great start, getting there is another story. Whether you're investing for retirement, living in retirement, or saving for a college education, a home, or other goals, we can help you with financial planning and investment advice. Our partnership with you is at the heart of our service. We work closely with you to develop a customized goals-based financial plan according to your unique situation—and can manage your portfolio throughout your retirement years. Whether you're saving for retirement, a college education, a home or other personal goals. We will listen to you and identify what you need. 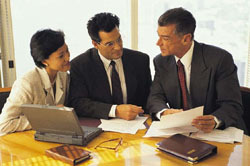 We will work with you to customize a portfolio for you that match your risk tolerance, time horizon and personal goals. We will give you the confidence that you are following an appropriate strategy with well-selected investments, plus an ongoing relationship with an experienced team. We want you to have the best chance at investment success. You may feel that you do not have the time, the willingness or the ability to self-manage your investments. Researchers have found that advisors who create well-diversified, balanced, and cost-efficient portfolios for their clients can add considerable value compared with what investors can achieve on their own. An advisor can also add value as a behavioral coach. By helping you set a sufficient savings rate or by helping you craft and adhere to a dynamic portfolio withdrawal strategy in your retirement years, an advisor can make a meaningful difference over time to the size and longevity of your portfolio. and many other financial issues.